This thought leadership paper explores the challenges universities face when implementing efficient delivery systems for hazardous materials and also presents solutions to better their current methods. Just-in-time (JIT) delivery is an inventory system many organizations use to receive goods only as needed during the production process rather than stockpiling large amounts of a particular item. JIT delivery is certainly not a new concept; it has been used successfully both in the private and government sectors for decades. In the case of delivering important materials such as disposables and chemicals to those in the research and development fields, any in the pharmaceutical industry have adopted a type of JIT delivery system in order to reduce their costs and waste. for major research initiatives in higher education; however, universities are not accustomed to the “business” of creating a product or streamlining a workflow. Most universities have not yet adopted a JIT delivery model, but they will need to adopt more streamlined and effective delivery models in order to meet the increased demands of the scientific discovery industry. 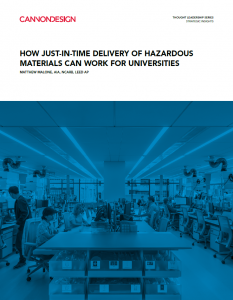 Download this whitepaper to see the challenges universities face when implementing more efficient methods of hazardous materials and learn about some solutions to consider.